To execute the mission of the Visitors Bureau to attract and serve visitors to Johnston County, the VisitJoCo team engages in many tactics including direct sales, trade shows, media missions and public relations. Local tourism-related businesses are invited to get involved and work with our team to promote your business as well as the whole destination. Let&apos;s work together! 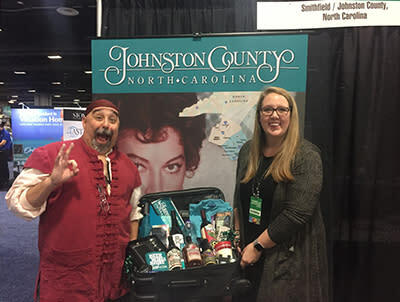 To attend trade shows, visit the NC Welcome Centers, or create packages to drive more visitors to your door, you will want to work with Sarah Elizabeth Lagasse, Sports and Leisure Sales Manager. Click through to the detail page to learn more about projects and programs. If publicity and marketing of your business, festival, or product is what you need, Ashby Brame, Marketing & PR Manager, is the staff person you want to work with. We are in the business to promote so we need your stories, photos, and participation all year long. We are social and want to be social with you!